Alright guys, due to some severe paranormal activity lately, I've decided I want to know the history of the building I live in. So far, what I've found is record of it being lived in as early as 1884. 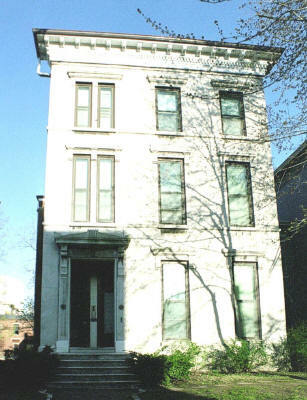 However, according to the site I was at (www.oldlouisville.com) that was as early as they had accurate recordings of residency/ownership of buildings. The style of building I'm living in, the Italiante style, was introduced to Louisville around the mid 1850s. This gives us a time line of the building being built, owned, and/or resided in between 1850-ish and 1884, after which I have pretty accurate records of residency. Now, here's the kicker. IF the building was built before 1865, the basement was slave quarters, which is what Sir believes it to be. Several people have been in the basement (including myself three times total in a year... Sir does laundry, I refuse to go down there), and felt severely negative energy. All of them, including myself, felt either distraught, angry, sad, or scared. I've also had several incidences of nearly being pushed down the back stairs from the 2nd floor to the first, when I was the only one in the stairwell. We know that this stairwell was used as servant stairs. -The Lady of the House: This lady, dressed in something like this, will walk up and down the front stairs. I've seen her several times now, and once, both myself and a friend of mine came to the top of those stairs, where I was showing her where I often see the Lady, and we both got knocked with this breathless feeling. Almost as though we were feeling what the Lady was feeling. -My Apartment: In my and my fiance's apartment, we often hear knocking on the walls (not in, quite a different sound), as well as dishes moving around, when neither of us are in the kitchen. When I talk about other ghosts, or read about them, or watch a video on them or whatever, I can feel someone watching me, as though jealous or angry. We also often get cold chills. -The Baby: Several times now, I've heard a baby crying in the building. No children live here, and when I've asked neighbours, they said there were no babies in their apartments. -The Basement: My fiance, and another neighbour, have both said they believe the basement to have been slave quarters. The stairs to the basement connect through a foyer to the back stairs, which reach the second floor but not the third. I've only been in the basement three times, due to my severe fear of heights (the staircase throws me off balance) and the extreme negative energy in there. My fiance has gone down to do laundry and seen candlelight and heard voices. When that happened, we called the police, thinking that squatters had gotten into the building, but when the police got here, they looked and there were no signs a candle had been down there, no footsteps in the dust, nothing. -The Back Stairs: I've often felt something on the back stairs. I've heard voices, and been nearly pushed down the stairs when I was the only one in the stairs, as though someone were running past me. -Outside: Often, while outside, if I'm walking through the parking lot, I can feel someone watching me, as if from above and/or behind me, or both. I've turned and looked back at the building, and seen faces in my apartment windows, even when I know I've just left an empty apartment. -As I type this, I can feel someone watching me, looking over my shoulder. My fiance is in the living room, and I am in the bedroom. When we had cats, they would freak out at random, like come out of dead sleeps and jump 3 feet in the air out of no where. I've also had book pages turn on their own, and the other day, I'd left the apartment unlocked because I couldn't find my keys (despite having put them in the same spot I always do), and came home to a locked apartment. My fiance was at work. Definetly sounds interesting. If we were to come out there to investigate we would need to get permission from management if you could give us a contact number that would be great. If you would like you can send it to Christel on the web page www.nkyps.com. I will definitely talk to my landlord, or have the fiance do it. I'm sure he wouldn't mind having the place investigated . We actually have two empty apartments on our floor as well. One was recently vacated (well a few months ago), and one had a fire in it in around August. I don't know if there's been any activity in them or not. As for feeling different when watching shows about ghosts, it's also if I'm reading a book about ghost stories (I've had ghosts CLOSE THE BOOK), or talking to someone about THEIR hauntings. It's very odd. I've also had the feeling someone was reading over my shoulder, and have pages of books turn on their own. When I say that, I mean they cannot have been turned by wind, because when I read, I hold both sides of the book, so the pages are pulled away from me. If I say something like "I wasn't DONE with that page yet! ", the page will turn back, and that will stop for the night. I'm actually just a few blocks from where you were last week (The Old Louisville Cafe). That's a picture of my building before the fire, and before they built a hand rail. Yeah, I'm on the 1000 block of 4th st. And like I said in my original post, I can trace the building back to 1884, but believe it to be older than that. The architecture type, Italiante, was introduced in the mid 1850s. I believe the building to have been build around 1860, just based on the style of dress of the Lady of the House. Oh hell YES I want to Give me a couple weeks, and I'll talk to him By the way, did ya'll say "Bet that one's haunted" to my building? You were probably seeing the Lady of the House. She often stands at the front door and looks out, which is something I've noticed too. The ghost we call the Lady of the House... I see her often walking the stairs, and I remember the first night I got here, it was about 3am when i got here, i was waiting at the door for my then boyfriend to come let me in, and there she was, clear as day, looking out at me! New developments in my bedroom. I am on a weekly chat on paltalk, which allows you to talk on mic. Apparently, people heard laughing, couldn't hear me talking, and then heard me talking about 3 minutes after i'd STOPPED talking. At that same point in time, I was (and still AM!) freezing cold. Cant wait to get there to document this stuff! I am officially 100% freaked out... The ghosts have lost it tonight and are going crazy... We need to get this investigation going SOON. UPDATE UPDATE UPDATE! I just received two emails from a lady who found me either on genealogy.com or ancestry.com, not only with information on the original owner of this building, but a copy of his death certificate! Crazy! Wow, really, did he die in the house? Looks like he did, actually, of an acute pulminary oedima. I've also got his daughters death certificate. Geez, That is pretty cool that someone contacted you with the history. Did they say why they chose to do that? It may have been someone that frequents our forum that got you address or something. What ever you do DONT TELL your ghost that this is a paranormal website. They might try to turn off your computer!! LOL, I hope they're not that smart. You definetly sound like you have some issues to get sorted out there. **edited by admin**. I removed these because we did not have permission from the property owner to share there publicly but appreciate your info. No problem thats why we are here just to make sure everything runs smoothly. Great information you have actually done a lot of the work for us which is greatly appreciated. That will save us an extra trip we would normally have to make to investigate the history on the property. GREAT JOB! !